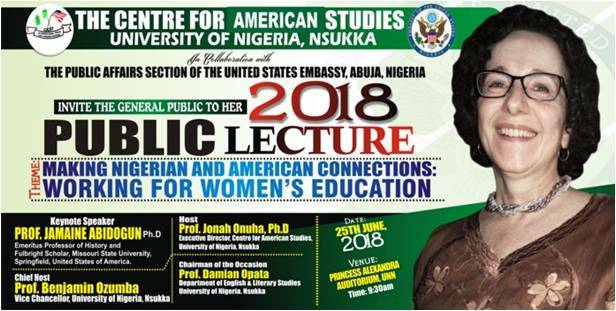 The centre for American Studies (CAST) University of Nigeria, Nsukka in collaboration with the Embassy of the United States in Nigeria wish to invite you to a public lecture to be delivered by Jamaine Abidogun, Ph.D, an Emeritus Professor of History and a Fulbright scholar from Missouri State University, Springfield. The title of the lecture is “Making Nigerian and American Connections: Working for Women’s Education”. Host: Centre for American Studies, University of Nigeria, Nsukka. We look forward to seeing you on that day.